Attention deficit hyperactive disorder (ADHD), a hyperactivity disorder prevalent among children may continue as an adulthood attention deficit. 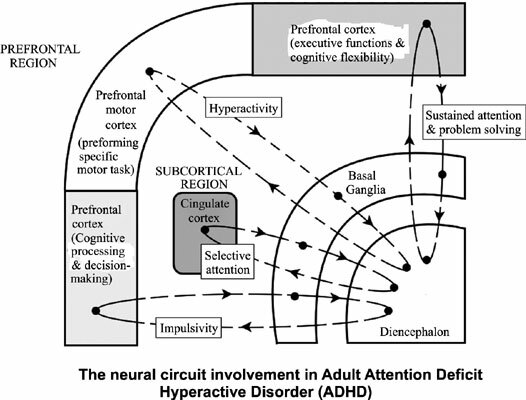 To date, treating an individual with an adult ADHD may be an arduous task as it involves numerous challenges, which include a need for high index of suspicion to diagnose this medical condition. Many psychiatric disorders masquerade as ADHD and delay the necessary assessment and proper treatment for this debilitating medical disorder. Adult ADHD is often misdiagnosed (or under diagnosed) due to the fact that this medical condition is being masked by the patients’ high level of intellectual achievement. As the ADHD in adult persists, it may end-up with impairment in the personal-social-occupational function in which the management becomes a great challenge. The treatment of ADHD can be optimized by using various drugs targets agents like norepinephrine-dopamine reuptake inhibitor (NDRI), with or without psycho stimulants like methylphenidate, which is marketed as Ritalin. Bupropion, an NDRI has a novel effect on ADHD as the molecule exerts its effects by modulating the reward-pleasure mesolimbic dopaminergic system and at the same time regulates the elevating mood dimension of the noradrenergic neurotransmission. The role of Bupropion in the neural and psychopharmacological perspective treatment of ADHD was deliberated. The present review highlights the novel effects of Bupropion in ADHD treatment, together with the help of other successful bio-psycho-social measures. This may be of immense benefit to the psychiatrists for treating their patients. Bupropion, novel antidepressants, treatment, adult ADHD.